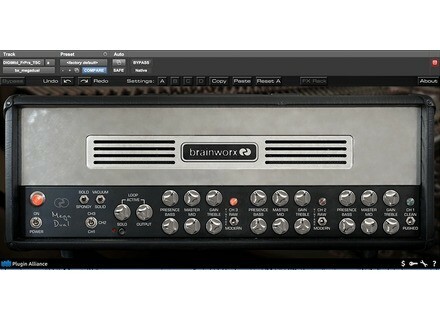 bx_megadual, Software Amp Simulator from Brainworx. 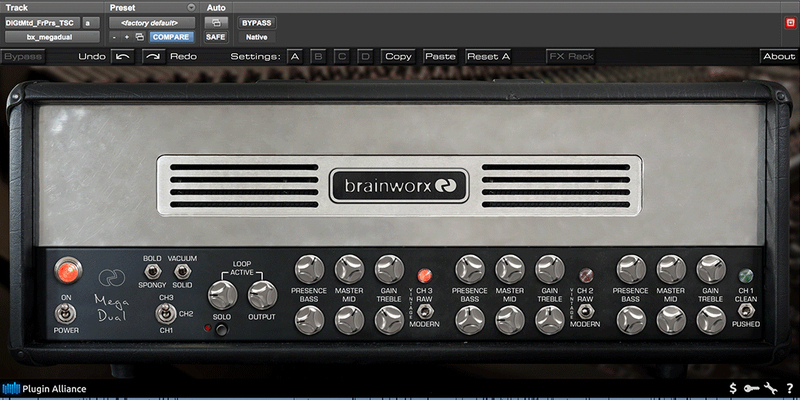 What configuration, software and musical style or context do you use with this amp simulation software? Is its anti-piracy protection excessive or burdening? Doesn't seem so, at least not so much. Is it easy to use? Are its parameters straightforward? Instant for anyone after the kind of sounds it's intended for (rock/metal), but full of surprise for those (like me) using it in a less conventional context. What are its possibilities in terms of effects and routing? Much wider than I'd expected, which is what convinced me to write this review. Are the clean, crunchy and distorted tones as well as any additional effects realistic? Yes, and that's what impressed me instantly. Attracted by the Plugin Alliance's very interesting end-of-year bargains, I gave it a try as I'd heard good things about it. I wasn't especially convinced beforehand, just wanted to see how different it could be from what I already heard until then, as Brainworks has a great reputation. I'm not a specialist of that sort of sounds, still I believe to have a certain idea of how the signal out of a real amp is supposed to sound. And on that very point, none of the other amp sims I own (waves gtr 3, Guitar Rig, plus many freewares) has managed to convince me - at best they do the trick and this is it. Well, this is an instant killer! It sounds alive, I never would have believed it to be possible. The UI and numerous parameters are a real pleasure to play with, making it a real sound design and mixing tool way beyond a mere heavy sounding guitar amp. I experiment with it as with a real unit, with all sorts of sounds: voice, synth, drums... It manages to surprise, creates textures, brings life into the sound and it can be used with subtlety (which is what I'm particularly interested in) or the utmost violence (it's really successful at recreating that typical sound, but I'm not interested in it). Is the sound quality of the available presets satisfactory? They sound rather good to me, but they don't match the kind of use I'm after. So I won't develop much on that point. Well, what's sure is it's all about the one classic, heavy, bassy metal sound. What are the pros and cons of this amp simulator? The pros, well I've been on it since the very first line of this review. The cons, which is common to all Plugin Alliance plugins, is the lack of an internal preset management system (more or less of a problem depending on the DAW you use). I rated its value for money as excellent, but please consider that I bought it on sale for $29.